As we neared ever closer, we were prepared for and fully expected a lot of roadblocks. There were only two places that we had to stop for only minutes at a time. And the road workers were so cheerful! What has been achieved in little more than one year is truly amazing. 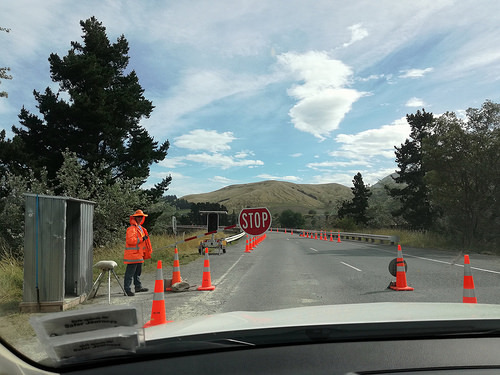 The teams worked 24/7 to get the project to a stage where the busy Christmas traffic could flow both into and out of Kaikoura. This road is also the main arterial road for freight. 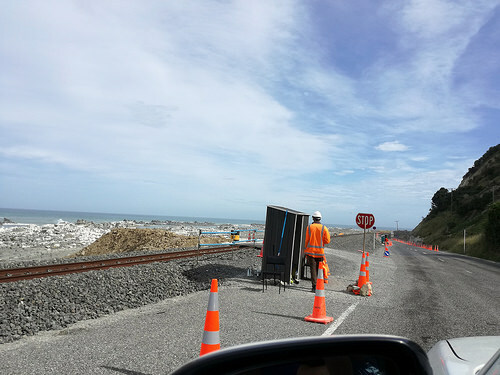 The railway line, which follows the road closely, is mainly still closed but we expect the passenger trains to start running again by mid 2018.
Business in back in Kaikoura again! We spend two night at the charming and rustic Kincaid Cottage 5 kms out of the Kaikoura township. 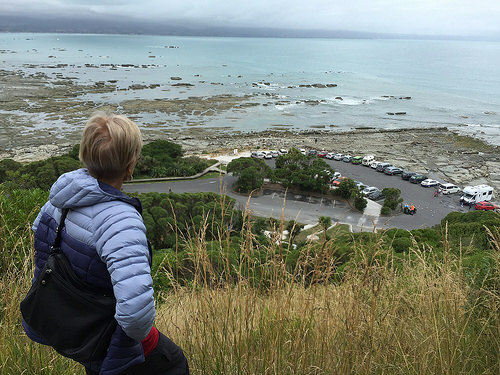 We made numerous trips into Kaikoura and the peninsula to check out the walks as well as the Whale Watch & Bird Lovers tours! And as this photo shows, plenty of campervans and tourists milling around. The seal colony here is a major attraction and the views up and around this hill are superb. Due to the shoreline being lifted up to 2.5 metres, the harbour entrance had to be cleared for the Whale Watch tour boats. This could only be done by blasting a way through with dynamite. So the New Zealand Parliament had to pass a special emergency law to allow this to happen. What a job! 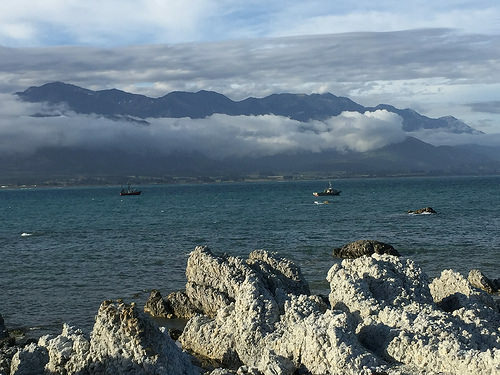 Kaikoura is famous for its Whale Watch Tours, dolphins and generally all things aquatic. Don’t expect an array of great restaurants. But there are a few gems to be found. 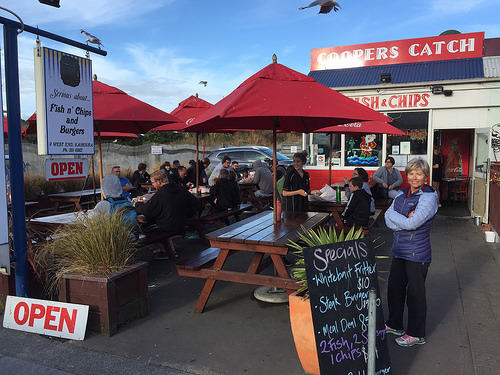 No trip to New Zealand is complete without checking out the local Fish’n’Chips shop. The evening we arrived, this place, located in the main street, was humming. There was a queue going out of the shop and believe me, that’s always a great sign! A handy hint if you’re doing the Kaikoura Road Trip for the very first time. Find out where all the locals are eating, because they’ll be the best places. If you continue through the township and go along the Peninsula, you’ll find the lovely Green Dolphin Restaurant – gets wonderful reviews. Also opposite the Green Dolphin there is a pub with views across the harbour and a great local vibe. If you travel further along for another 10 minutes or so, you’ll come across a great communal eating place with caravans selling grilled fish and salad. If you’re still rushing to buy presents for an occasion or to thank a host, there are a couple of really lovely homeware interior gift shops with quality goods and local artwork. Definitely worth a browse. The complete rebuild of the road will take another year or two. During this time the road will be most likely closed at night between 8.30pm and 7am. So travellers need to keep this in mind. Also, with any heavy rainfall, there could be new road blockages and delays. Again, travellers do keep yourselves informed. 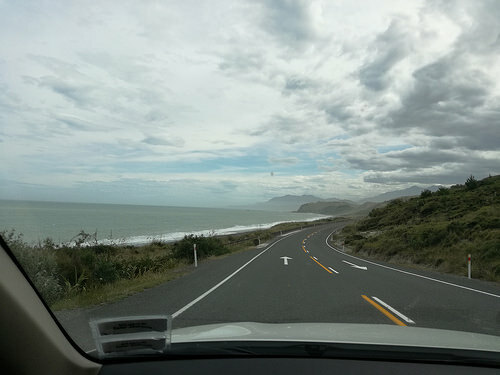 So, happy to say that our recent Kaikoura Road Trip was well worth the effort – Kaikoura is definitely open for business again. Travellers can now access the key attractions – the Whale Watch, Dolphin Swim and the Albatross/ Seabird tours. In any case we pay our respects to the local community and the contract builders who have achieved so much in such a short time – a huge achievement!